Floppy method - PC formatted 720 kB disk is required, if your PC has a floppy drive. It has small capacity and very slow (20kB /sec). How to transfer e.g. 50-100 MB of data? Ethernet card - The cheapest interface is 80-100 USD, if You can find it for sale. It requires a TCP stack, lots of RAM, an FTP client or SAMBA. In A1200 it is a working solution with a cheap PCMCIA card, however the Amiga -> Windows transfer is very slow (~100 kB/s) due to problem in SAMBA implementation. Amiga -> Linux and Windows -> Amiga transfer is working much faster. Removable HDD method - The system should be shut down in order to change the HDD / CF card. PCMCIA CF adapter - It is a good solution, but limited to A1200 / A600 with PCMCIA slot. For the big box Amigas we are proud to present the solution: the SD Drive. SD Drive is not a slow floppy emulation, but a real, on the fly removable device with excellent performance! Why to emulate a floppy if today every Amiga has lots of RAM and WHDLoad support for almost every stuff You ever wanted to play or watch? SD Drive was born to solve all these data transfer problems listed above. 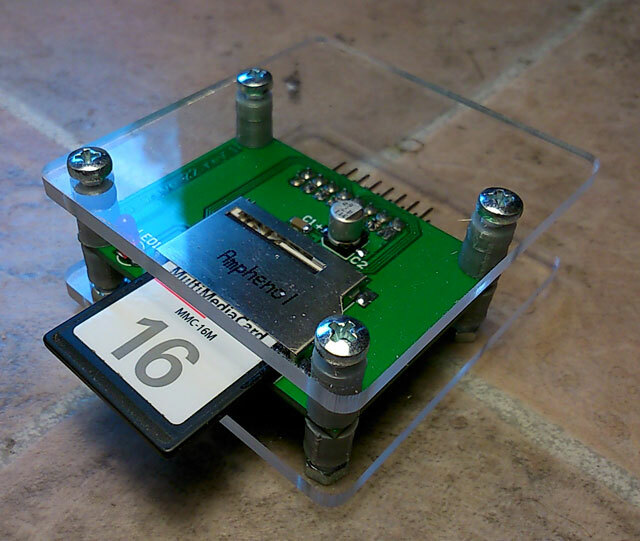 No need for a clockport, no need for a SPI bus; SD Drive is a complete plug'n'play solution. 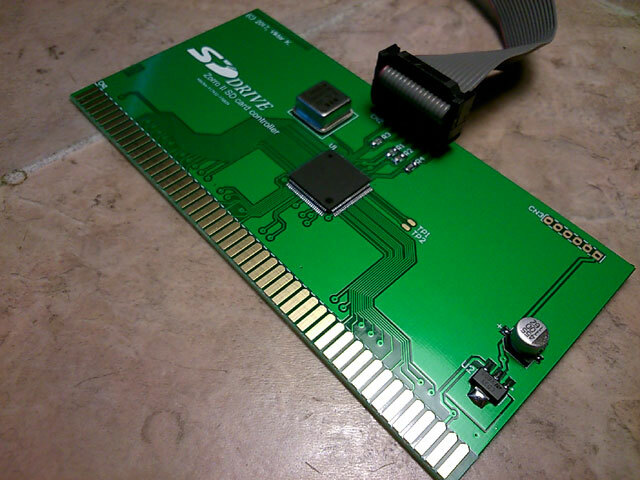 SD Drive is a Zorro 2 card, compatible with all Amiga models equipped with Zorro 2 or 3 bus, including the most popular A2000/A3000/A4000 machines, running AmigaOS 1.2 - 3.9. SD Drive offers reliable file transfer using cheap SD / SDHC / MMC cards. The data transfer rate is 1.2 - 1.5 MB/sec, which is ideal for copying even large amount of data between your computers. There is no limitation in card size: SD Drive can utilize any size cards. All cards which are >4 GB will be formatted to 4 GB. The installation is very simple: Plug the autoconfig compatible card into a free slot, connect the cable to the external card reader and the hardware installation is complete. It takes no more than 5 minutes! The flat cable is long enough (52 cm) to access easily the card reader module. On the software side only 3 files are required: the device driver (DEVS: directory), the mountlist entry (SD0:, copy it into DEVS:DOSDrivers) and the filesystem. The FAT95 filesystem should be available in L: directory. That's all. No need to run UAE on the PC side to access the files on the SD card written with the Amiga; SD Drive uses a native FAT16/32 filesystem, which is directly accessible by your Windows PC. SD Drive supports dynamic card sizing and hot swapping. 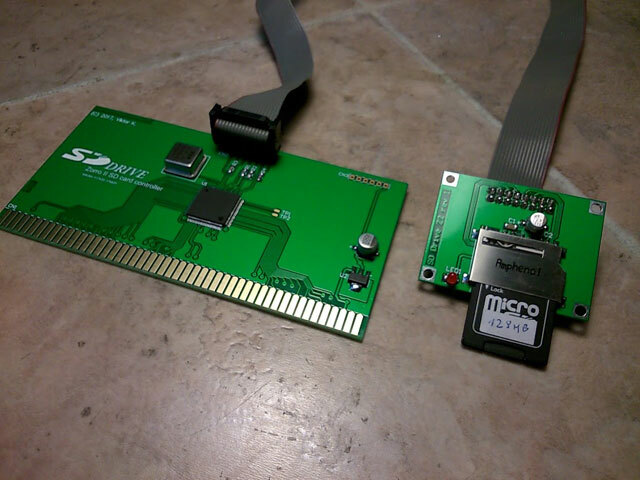 No need to reboot the Amiga to mount a new SD card. It works exactly like a regular floppy or ZIP disk, but with much more capacity and incredible transfer rate!